Lassi Hotel is a family-run hotel 250 m from the sandy beach on the shores of the Ionian Sea in Kafelonia. Located in a quiet area away from the town, the beach is just 5 minutes’ walk away and the town of Argostoli can be reached via a short walk. 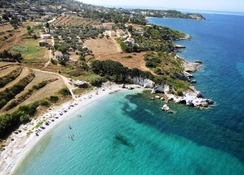 The popular beaches Platis Yialos and Makris Yialos are a short drive away. Featuring a swimming pool, an indoor bar and a strategic location, Lassi Hotel invites guests to enjoy a comfortable stay amidst all modern amenities and warmth and hospitality of the friendly staff. Spread over three blocks, air-conditioned guestrooms at the hotel include satellite TV, desk, electric kettle, fridge, en-suite private bathroom with toiletries, slippers and hairdryer. Lassi beaches have clean, deep blue waters surrounded by majestic landscapesThere is plenty to do while in Lassi—tourists can walk about Lassi's perimeter round (Giros Lassis) while enjoying great sea views or watch a romantic sunset at Lassi' s Lighthouse. 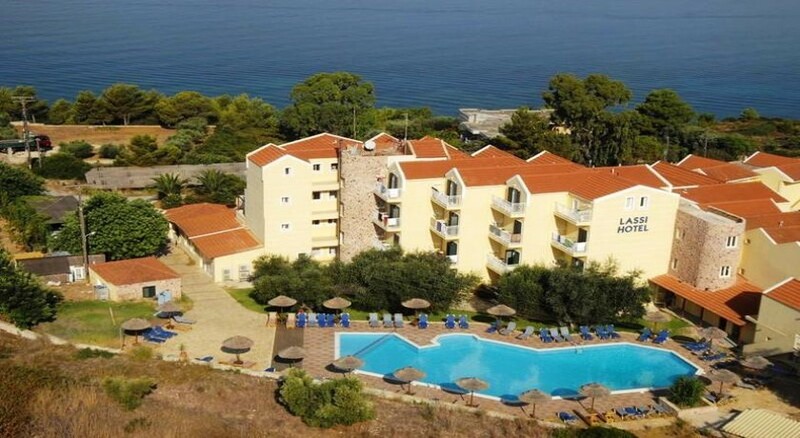 Lassi Hotel is 250m from the sandy beach enveloping the Ionian Sea in Kafelonia. Located in a quiet area away from the town, the beach is just 5 minutes’ walk away. The Kalamia Beach is located down a steep track from the unnamed coastal road that connects Fanari to Lassi. There are sea caves to explore, guests can also swim in the beautiful turquoise waters or relax on a sunbed, or at the beach bar. Good restaurants, bars and shops within a 10-minute walk. Town of Argostoli is within 1.5km from the hotel and Makris Yialos Beach is at 1km. The nearest airfield, Kefalonia International Airport is at 5km. The hotel has immaculate and furnished studios, guest rooms and one bedroom apartments with attached balconies overlooking the sea or the swimming pool. The non-smoking rooms in contemporary décor are equipped with all modern facilities such as en-suite private bathroom, satellite TV, hair dryer, air conditioning, refrigerator and telephone. Lassi Hotel provides a sumptuous breakfast buffet including cakes, fresh fruit and beverages with views of the garden from the dining area. Guests can relax at the stylish snack bar sipping cocktails. Good cafes, restaurants and bars are just a short walk away. Lassi Hotel has three swimming pools and kids’ pool and terrace besides access to the private beach. There is a library and a shared lounge and TV area where guests can spend time. The hotel can be a perfect base for those who wish to discover the exceptional natural beauty of Kefalonia.